That might be a solution for people who want to listen to audiophile HD music files, but want something mobil. Pair the above DAC with a good set of headphones and you are ready to go – anywhere you carry your laptop. Cost: $500 for the above DAC plus the price of a set of headphones. What’s up there? How many countries have stuck satellites up into space, how many of those satellites are working, part-working or just bits of junk? This graphic may help to enlighten you. Spacejunk! Click here to enlarge. The dirty secret of the Billboard classical charts is that album sales figures are so low, the charts are almost meaningless. Sales of 200 or 300 units are enough to land an album in the top 10. [Hilary] Hahn’s No. 1 recording, after the sales spike resulting from her appearance on Conan, bolstered by blogs and press, sold 1,000 copies. In early October, pianist Murray Perahia’s much-praised album of Bach partitas was in its sixth week on the list, holding strong at No. 10. It sold 189 copies. No. 25, the debut of the young violinist Caroline Goulding, in its third week, sold 75 copies. I have mentioned Temple Grandin a few times before – here and here. Oh, I do like the concept of neurodiversity. 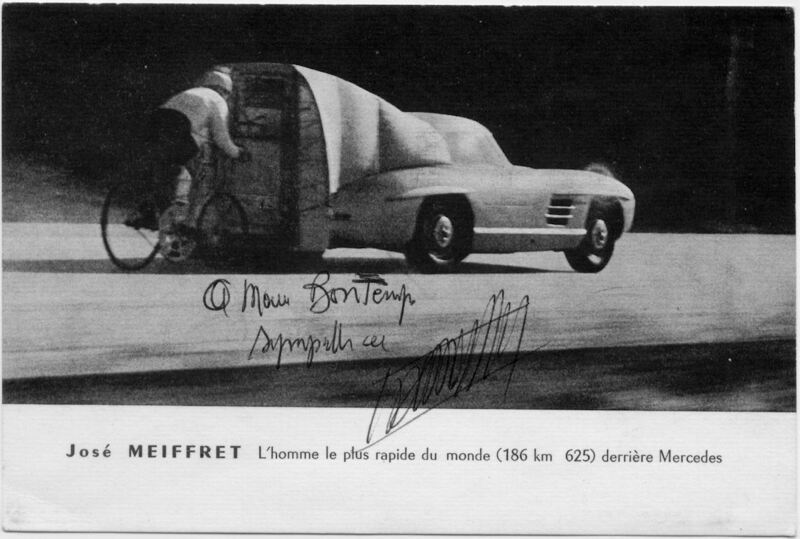 Cool photo of a bicycle speed record, achieved behind a Mercedes, sometime in the fifties I guess. And lastly, a very interesting TED video. Health is relative to Genetics AND Lifestyle, but have we considered the third pillar, the environmment, or where we live? Seems obvious, but has a doctor every asked you about your home-history, where you have lived? Check out this brief TED talk by Bill Davenhall. Neobohemia has a nice post about Ozu‘s famous tatami view. This week I watched Tokyo Story, which is a brilliant and beautiful, if not exactly uplifting movie Ozu made in 1953. Highly recommended and on many directors top ten list. …any attempt to view such a life through a camera held up high on a tripod was nonsense; the eye level of Japanese sitting on the tatami becomes, of necessity, the eye level through which they view what is going around them. A brand new tatami has a great scent and Ozu-san was a great director with his own distinctive style. In a music recording setting, the term “crosstalk” can refer to the leakage (or “bleeding”) of sound from one instrument into a microphone placed in front of another musical instrument or singer. A common example is the leakage of the high-pitched, heavily-amplified sound of the lead guitar into the microphones for other instruments. Note that this is nearly always an acoustic effect, not electrical. And, in any case, bassists usually love being right next to the drums. The following image shows the angle from the audience, in Orlando. Nevermind the weird altar-like contraption behind Jon – it’s supposed to keep people from falling down the stairs to the dressing rooms which are in the basement. If you have center tickets, you will have a great view of the whole band. Almost a year ago, on February 5th of last year at exactly 15:02, I posted the first entry in this journal. Soon we will have two music posts per week, a new piece and one from a year ago. This Neobhemia post went well with our snow yesterday. I read the music of sound blog this Morning and he makes some interesting points regarding the iPad. the music of sound » Apps for your iPad? But also the Dexter, which is a more DAW specific remote based on the same technology as the Lemur. In fact for ProTools it already exists as the ProRemote but expanding it for a larger screen will have a huge impact on its usability. Lastly, for engaging with music the iPad could make a great start back to the days of vinyl in terms of displaying artwork & liner notes….. well…. realistically back to 7? single territory at least…. the 12? LP still reigns supreme in that respect! Jon mentioned to me today that the iPad will be the ultimate sheet music format. It will sit on a music stand, and you could store zillions of songs as PDF’s! He said, page turns will be effortless, the size will be smaller than any fake book, on and on- this is exciting. You could even sync a cursor to some sort of time code and “follow the bouncing ball” if you want. I could see every Broadway band or classical orchestra storing their entire repertoire on iPads – they can interact with their scores without needing a mouse. And the possibilities for music students are endless. Imagine seeing the score and having a built-in metronome and being able to change the tempo of the piece one is practicing. Pianists won’t need anybody turning the page of their score…. Dozens of robotic band members will join jazz guitarist Pat Metheny on his next international tour. It’s the same backup band that accompanied him on his latest album, Orchestrion, producing sounds both familiar and alien. Not only does the visual spectacle of robots playing along with Metheny’s always-impressive guitar work hypnotize the viewer, but it sounds great for the same reason live orchestras sound so much better than CDs: They’re essentially 100-point surround sound speaker systems housed in a massive acoustic space with its own resonances, and no home theater (well, no home theater without robot or human performers) can duplicate that sound. I dislike both of those words, because for me, the so-called immaterial and spiritual is always vested in the fleshly — in “the holy and glorious flesh,” as Dante said. Very quiet, very still. A landscape like a painting. It started snowing early this Morning but, thanks to the Winter tires on my front wheels, I was able to leave the hill for breakfast with Jon. It ended up snowing for most of the day, the biggest snowfall of the Winter so far. When the iPhone was first shown in 2007 many rival smartphone manufacturers didn’t think it would gain much of a market share. I don’t think that was PR, I think they probably genuinely didn’t get it, meaning they didn’t understand the appeal of such a phone without buttons. Now Apple, on the strength of the iPhone and the App store, has become the largest mobile devices manufacturer in the world. Hm, maybe like playing Nouveau Flamenco for a traditional Flamenco fan – they would have said (((did say!! ))), what on earth is that??? It seems nerds don’t like the iPad, because it doesn’t do multi-tasking, doesn’t have a fast enough processor, doesn’t have a camera (((and I would like to be able to attach the tablet to my studio computer and use it as an input device – instead of using a mouse – for editing…))) yada yada yada, but once again there is a misunderstanding here, a rather big one. Apple did not design the iPad for me or for nerds. Nerds can fiddle with Linux or build their own computers from spare PC parts. Nerds are also a rather small buying group overall and, I imagine, not very brand-loyal. I think Apple is going for a much larger audience than that. To put that in perspective again, if I had written and produced NF to impress Flamenco afficionados and Flamenco guitarists, the album would have been a failure. Not only would the album not have appealed to them, they would also have been too small of an audience to sell a decent amount of records. Not that I imagined to sell more than the initial 1,000 copies Frank Howell made, but in hindsight it is pretty clear that the album would not have sold over two million copies if it had been more traditional. In that case I would still have a day-job somewhere in Santa Fe, and would perform at local restaurants and bars. Nothing wrong with that, naturally, but my life would have been rather different. In fact, I don’t think there is a more traditional sounding Flamenco album that has sold even half a million copies in the USA. Go to the Grammy website, start a RIAA Gold or Platinum certification search and plug in the most famous Flamenco guitarists you can think of, say Paco De Lucia or Vicente Amigo… and you will come up with… nothing, zero. Their music, although very beautiful, appeals to a narrower slice of the public. Back to the iPad, maybe Flamenco afficionados and guitarists are similar to the nerds who hate the iPad. But the public, I think the public will love it and buy it. I think my dad would have loved it. Even in his nineties he would have grasped the brilliant concept and the simplicity. The iPad is for people who are intimidated by a computer, by people who look at a computer’s desktop and wonder how one can get started. I mean, you could leave an iPad in your living room and everyone who comes for a visit would play with it. Getting around an iPad is child’s play, in fact every pre-school should have several. Imagine interactive lessons for grade-schoolers on the iPad. Yeah, I do want one for our bus this Summer! And that gives me another idea: hm, wouldn’t it be great if you could create separate accounts on every iPad, so that I could sign in to check my email, then Jon could sign in to read his book, then Michael could sign in and watch one of his movies… and then combine that with the concept of storing music and movies and data in the cloud and the tablet would become an empty container, a furoshiki to be used by anyone with a login!! That would mean that every hotel could have a bunch of these slates lying around in their lobby or the restaurant, for anybody to grab, sign in and use while they are visiting, to read the news, check their email, message their friends… Oh, well, in ten years maybe? Twenty? – with video. I have written about barefoot walking versus wearing shoes before – here, and here. The human thirst for the transcendent, the numinous—even the ecstatic—is too universal and too important to be entrusted to the cultish and the archaic and the superstitious. In this honest and serious book of self-examination and critical scrutiny, Stephen Batchelor adds the universe of Buddhism to the many fields in which received truth and blind faith are now giving way to ethical and scientific humanism, in which lies our only real hope. I just sent him an email, wondering whether he used one of my photos of him. Now that physics is proving the intelligence of the universe, what are we to do about the stupidity of mankind? I include myself. I know that the Earth is not flat, but my feet are. I know that space is curved, but my brain has been cordoned by habit to grow in a straight line. What I call light is my own blend of darkness. What I call a view is my hand-painted trompe-l’oeil. I run after knowledge like a ferret down a ferret hole. My limitations, I call the boundaries of what can be known. I interpret the world by confusing other people’s psychology with my own. I say I am open-minded, but what I think is.